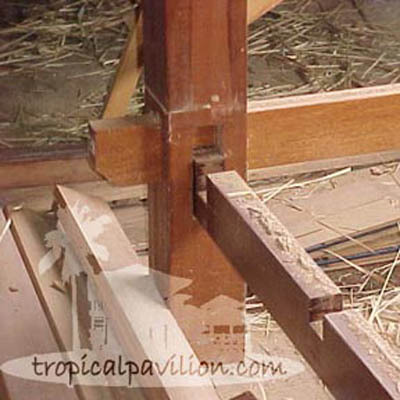 Rafter Joinery system using stainless steel bolts and screws. 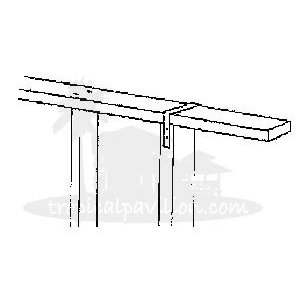 Flooring joist support frame using stainless steel bolts and screws. 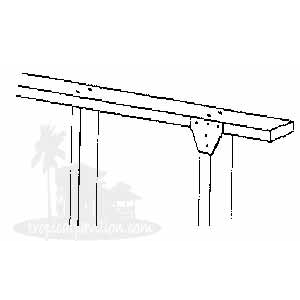 The flooring support beams fit into each gazebo post using a notch and groove system. 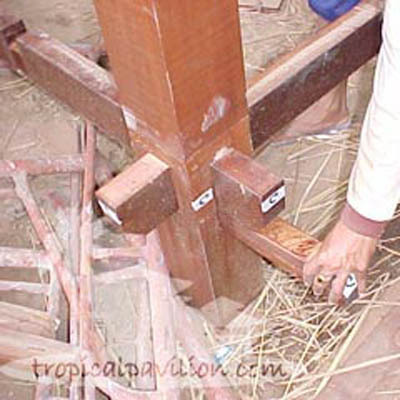 A nock is inserted below the flooring support beams and post of this 3×3 m Bali pavilion. 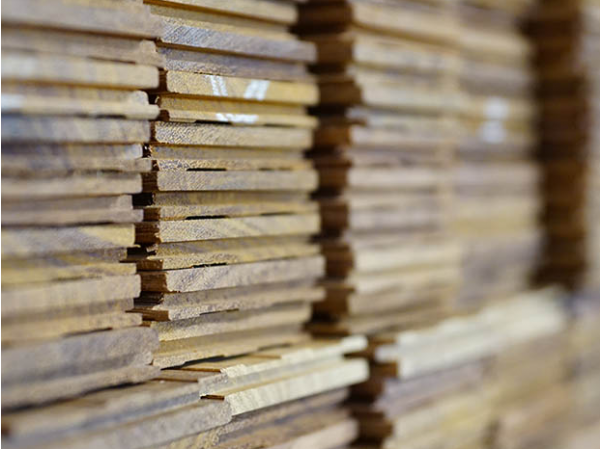 We realize that high quality wood deserves high quality finishing. 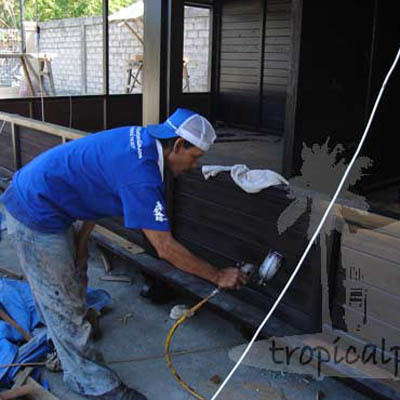 All of our wooden prefabricated housing and pavilions are finished with techniques used in the furniture industry. A series of paints and glosses are applied and sanded down at various stages producing a really beautiful end result. 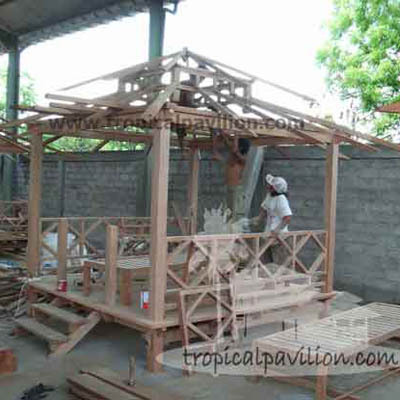 Bali sunbrella pavilion being prepared for its first coat of paintbeing prepared for its first coat of paint. 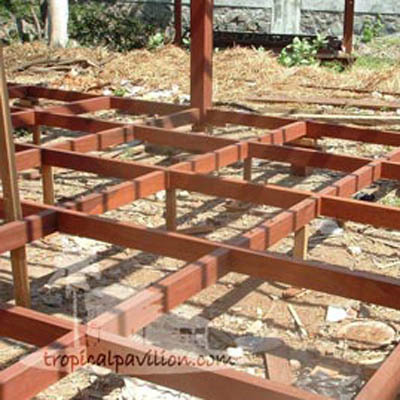 This 8x5m wooden house is being prepared for its first layer of paint. The first of a set of paints is being sprayed onto the wall panelling. 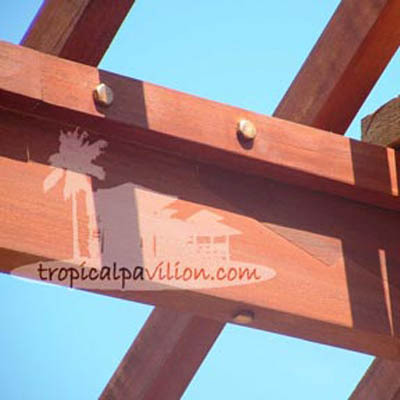 In timber houses the rafters or trusses are connected to a wall plate which is supported by the vertical posts. 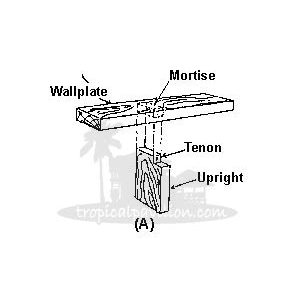 Diagram A shows a standard mortise and tenon joinery method used frequently in wooden houses. 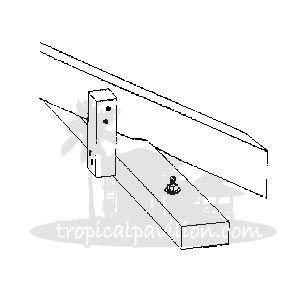 High suction forces on the roof may cause this joint to fail. 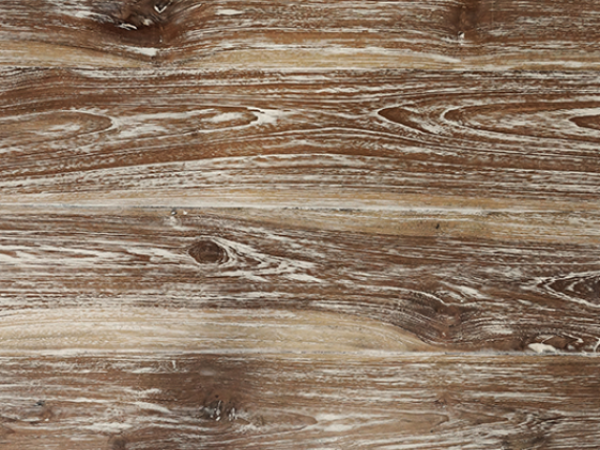 A timber connector of strong wood can be used as an alternative. 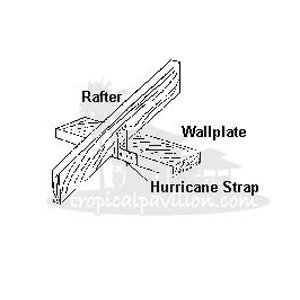 We recommend using a combination of metal plates and hurricane strap system. 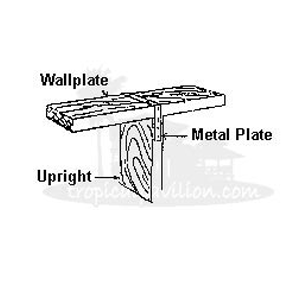 We use 20 gauge galvanized sheet metal for all our plates and straps. 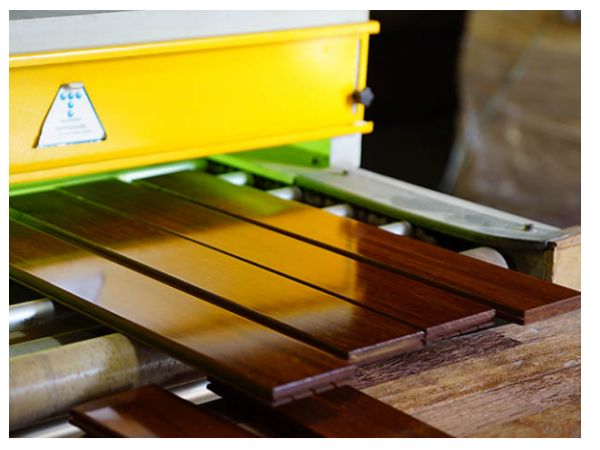 Wall plates for wooden buildings are also critical because they provide stiffness for the building and also serve to hold the roof down. Wooden buildings are one of the safest type of construction to be in during an earthquake. 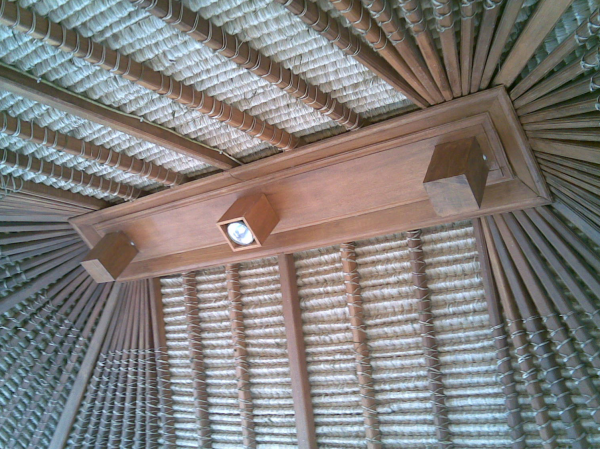 The reason is that the wood is flexible and moves with the force of the earthquake. 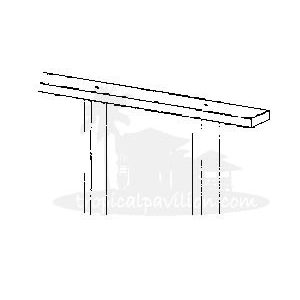 We advice using a longer wooden post that is dug into the ground and supported by reinforced cement. This concrete/wooden post positioning adds to the flexibility of the building putting less pressure on its structure during times of turbulent natural forces.